Bu araştırmanın amacı Öğrenci İlgi Ölçeğini (Mazer, 2013b) Türkçeye uyarlamak ve geçerlik ve güvenirliğini incelemektir. Araştırma 251 üniversite öğrencisi üzerinde yürütülmüştür. Doğrulayıcı faktör analizinde 16 maddeden ve iki alt boyuttan (bilişsel ve duyuşsal) oluşan modelin iyi uyum verdiği görülmüştür (x²= 185.62, sd= 95, RMSEA= .061, NFI= .92, NNFI= .95, CFI= .96, IFI= .96, RFI= .90, GFI= .92, AGFI= .88, SRMR= .051). Ölçeğin faktör yükleri .61 ile .84, düzeltilmiş madde toplam korelasyon katsayıları ise .56 ile .78 arasında sıralanmaktadır. Ölçeğin iç tutarlılık güvenirlik katsayıları duyuşsal ilgi alt boyutu için .90, bilişsel ilgi alt boyutu için .89 olarak bulunmuştur. Bu sonuçlar ölçeğin Türkçe formunun geçerli ve güvenilir bir ölçme aracı olduğunu göstermektedir. The aim of the present study is to examine the validity and reliability of the Turkish Version of the Student Interest Scale (Mazer, 2013b). Participants were 258 undergraduate students. The results of the exploratory factor analysis indicated that the original structure of the Student Interest Scale consisting 16 items and 2 factors was replicated. Two factors accounted for the 59% of the total variance. Results of confirmatory factor analysis demonstrated that the sixteen items loaded on two factors (emotional and cognitive; x²= 245.88, df= 99, RMSEA= .076, NFI= .90, NNFI= .92, CFI= .94, IFI= .94, SRMR= .056). The corrected item-total correlations ranged from .56 to .78. Internal consistency reliability coefficients were .90 for emotional interest subscale, .89 for cognitive interest subscale. These results demonstrate that this scale is a valid and reliable instrument. Acar, B., & Yaman, M. (2011). Bağlam temelli öğrenmenin öğrencilerin ilgi ve bilgi düzeylerine etkisi. Hacettepe Üniversitesi Eğitim Fakültesi Dergisi, 40, 1-10. Boekaerts, M., & Boscolo, P. (2002). Interest in learning, learning to be interested. Learning and Instruction, 12, 375-382. Büyüköztürk, Ş. (2010). Sosyal bilimler için veri analizi el kitabı. (11. Baskı), Ankara: Pegem Aka- demi Yayınları. Byrne, B., M., & Campbell, T., L. (1999). Cross-cultural comparisons and the presumption of equ- ivalent measurement and theoretical structure: A look beneath the surface. Journal of Cross- Cultural Psychology, 30, 555-574. Çetin, B. (2008). Türkçe, sosyal bilgiler ve sınıf öğretmenliği öğrencilerinin coğrafya derslerine olan ilgi düzeyi. Doğu Coğrafya Dergisi, 13(19), 33-48. Harp, S., F., & Mayer, R., E. (1997). The role of interest in learning from scientific text and illustra- tions: On the distinction between emotional interest and cognitive interest. Journal of Educati- onal Psychology, 89, 92-102. Hidi, S. (2006). Interest: A unique motivational variable. Educational Research Review, 1, 69-82. Hu, L., T., & Bentler, P. M. (1999). Cutoff criteria for fit indexes in covariance structural analy sis: Conventional criteria versus new alternatives. Structural Equation Modeling, 6, 1-55. Joreskog, K., G., & Sorbom, D. (1996). LISREL 8 reference guide. Lincolnwood, IL: Scien tific Software International. Krapp, A. (2002). Structural and dynamic aspects of interest development: Theoretical considerati- ons from an ontogenetic perspective. Learning and Instruction, 12, 383-409. Krapp, A. (2007). An educational–psychological conceptualisation of interest. International Jour- nal for Vocational and Educational Guidance, 7, 5-21. Krapp, A., & Prenzel, M. (2011). Research on interest in science: Theories, methods, and findings. International Journal of Science Education, 33, 27-50. Kuzgun, Y. (2006). İlköğretimde rehberlik (6. Baskı). Ankara: Nobel Yayın Dağıtım. Lin, S., H., Hong, R. Z., & Chen, C. Y. (2013). Exploring the development of college students’ situ- ational interest in learning science. International Journal of Science Education, 35, 2152-2173. Mazer, J., P. (2013a). Associations among teacher communication behaviors, student interest, and engagement: A validity test. Communication Education, 62, 86-96. Mazer, J., P. (2013b). Validity of the Student Interest and Engagement Scales: Associations with student learning outcomes. Communication Studies, 64, 125-140. Mazer, J., P. (2013c). Student emotional and cognitive interest as mediators of teacher commu- nication behaviors and student engagement: An examination of direct and interaction effects. Communication Education, 62, 253-277. Mazer, J., P. (2012). Development and validation of the student interest and engagement scales. Communication Methods and Measures, 6, 99-125. Palmer, H., D. (2009). Student interest generated during an inquiry skills lesson. Journal of Rese- arch in Science Teaching, 46, 147-165. Renninger, K., A., Ewen, L., & Lasher, A. K. (2002). Individual interest as context in expository text and mathematical word problems. Learning and Instruction, 12, 467-491. Riconscente, M., M. (2014). Effects of perceived teacher practices on Latino high school students’ interest, self-efficacy, and achievement in mathematics. The Journal of Experimental Education, 82(1), 51-73. Schraw, G., Flowerday, T., & Lehman, S. (2001). Increasing situational interest in the classroom. Educational Psychology Review, 13(3), 211-224. Sipahi, B., & Yurtkoru, E. S., & Çinko, M. (2008). Sosyal bilimlerde SPSS’le veri analizi. İstan bul: Beta Basım Yayım Dağıtım. Sünbül, M., A. (2011). Öğretim ilke ve yöntemleri (5. Baskı). Konya: Eğitim Yayınevi. Tabachnick, B., G., & Fidell, L. S. (2007). Using multivariate statistics. New York: HarperCollins College Publishers. Tapola, A., Veermans, M., & Niemivirta, M. (2013). Predictors and outcomes of situational interest during a science learning task. Instructional Science, 41, 1047-1064. Tela, A., Tela, A., & Adeniyi, O. (2009). Locus of control, interest in schooling, self-efficacy and academic achievement. Cypriot Journal of Educational Sciences, 4, 168-182. Weber, K., Martin, M., & Patterson, B. (2010). Teacher behavior, student interest and affective learning: Putting theory to practice. Journal of Applied Communication Research, 29, 71-90.
motivate them to engage in activities with higher priorities due to the limited time and energy. scale anchored by 1 (never) and 5 (always). Mazer (2013b) found Cron bach’s alphas of .95 for emotional interest, .88 for cognitive interest. The Student Interest Scale has not reverse item. interest in self-learning activities has been noticed by constructivist approach (Sünbül, 2011). for its psychometric validity and reliability properties. ISNAD UĞUR, Erol , AKIN, Ahmet , AKIN, Ümran . "Derse İlgi Ölçeğinin Türkçeye Uyarlanması: Geçerlik ve Güvenirlik Çalışması". 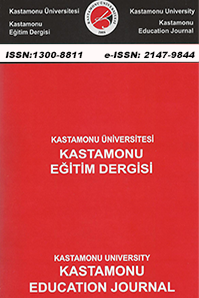 Kastamonu Eğitim Dergisi 23 / 4 (December 2015): 1471-1480.